What is green roof technology? Green roof technology is an emerging environmental practice in which the roof and/or the walls of a building are covered with vegetation. This sustainable insulation practice has become more popular worldwide over the past several decades. What are the benefits of a green roof system? Green roofs and walls can have multiple benefits, such as reducing heating and cooling energy costs, reducing stormwater runoff, filtering pollutants and carbon dioxide from the air, decreasing the heat-island effect in cities, reducing sound pressure levels through roofs, increasing urban biodiversity, providing green space for building occupants, and increasing the lifespan of roofing materials. Can a green roof be placed on any building? 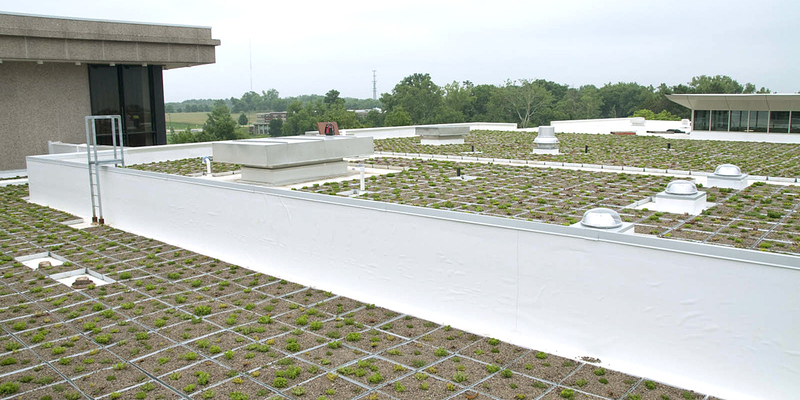 For existing buildings or new construction, there are structural requirements that must be met in order for a green roof system to be installed. The building must be capable of handling the additional weight of the green roof system, including the live load when the growth medium is fully saturated after a rain event or the added weight of snow (or ice) on top of the green roof. Further, the green roof specification process for any location depends on the local/regional climate, the amount of natural and reflected light the roof will receive, and the positioning of neighboring structures or buildings. What is the maintenance involved in a green roof? A green roof or green wall on a building is a living system. Like the living landscape surrounding a building on the ground, any elevated living system requires sufficient maintenance to perform as designed. Green roof and wall systems must have adequate moisture and nutrients and many require weeding or plant replacement as they mature. What are the first steps in planning a green roof? Speak with a knowledgeable engineer, architect, or landscape architect who has designed and specified living architecture. This professional will be able to assist you in bringing your project to fruition safely, economically, and with achievable goals!